Whether you’ve endured trauma to your teeth or are experiencing severe discomfort, a dental emergency can be scary. The best thing to do is to call your dental office immediately and see a dentist as soon as possible. Our Grande Prairie dentist, Dr. Smith, explains what gum disease is and how you can help prevent and treat it. A book is an easy and fun way to help your child prepare for their visit with your dentist. Dr. Nonkovic’s shares five of his favourite books for children about visiting the dentist. If your family is new to Grande Prairie, you may be in the market for a new dentist. This can be a difficult choice to make, so here are 5 tips from our dentists at Access Dental to help you decide. Keep your smile bright over the Christmas holidays with these oral health tips from our Grande Prairie dentists. Dental Implants: Your Top 5 Questions Answered. 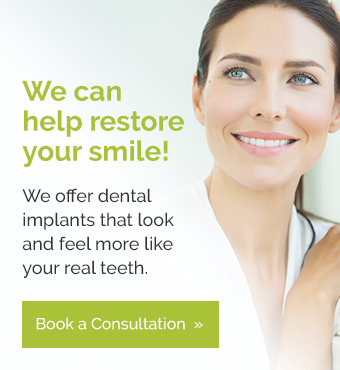 At Access Dental in Grande Prairie, our dentists get a lot of questions about dental implants. Here are some answers to the questions our patients most commonly ask! Sedation dentistry is quickly growing as a demand among dental patients due to the various benefits sedation offers. No matter if you are fearful of the dentist or need an invasive procedure, we can help you as a sedation dentist in Grande Prairie. Dental implants offer a lifelong solution to replace missing teeth. In addition, dental implants are the only form of tooth replacement to most closely mimic the appearance and function of natural teeth to regain a confident smile. Sleep apnea is a sleep disorder that causes interruptions in breathing frequently while sleeping. The most common cause of the condition is due to an obstruction in the airway. When you have lost a tooth, your incomplete smile often causes your confidence to decrease while also impacting your quality of life. Due to advancements in dentistry, you now have multiple options when it comes to tooth replacement. Among the most preferred option is a dental implant. We highly recommend limiting consumption of alcohol, soda & coffee to help prevent tooth decay and gum disease.